How to Get Apple Music on Apple TV? Apple has two music subscription services, which are closely connected through iCloud Music Library: Apple Music and iTunes Match. When iCloud Music Library is turned on, you can access your entire music library anywhere. Here, we're going to show you the best available ways to get Apple Music on Apple TV so it can be as painless as possible. Method 1: How to Play Apple Music on Apple TV 4? If you have subscribed Apple Music and iTunes Match, you can store up to 100,000 songs in iCloud and easily stream Apple Music & iTunes music on Apple TV when you turn on iCould Music Library. 1) On Apple TV 4, go to Settings > Accounts to log in with same Apple ID , which is used for Apple Music Account. 2) On your iPhone, iPad, or iPod touch, go to Settings > Music and turn on "iCloud Music Library" to sync all your music to iCloud Music Library. On your Mac: from the menu bar at the top of your computer screen, choose iTunes > Preferences, Then select iCloud Music Library to turn it on. On your PC: from the menu bar at the top of the iTunes window, choose Edit > Preferences. Then select iCloud Music Library to turn it on. 3) Now, you have the access to your Apple Music through Apple TV 4 and you can play them directly on TV. Why some users may want to leave iCloud Music Library turned off? At the moment iCloud Music Library is potentially dangerous to turn on. Users have complained about it creating duplicates, assigning inaccurate metadata and artwork, and/or restoring previously-deleted music. For people with large, carefully-tagged iTunes libraries, this can create chaos and undo years of work. In our own experiences, we've also run into some major issues in enabling the feature. 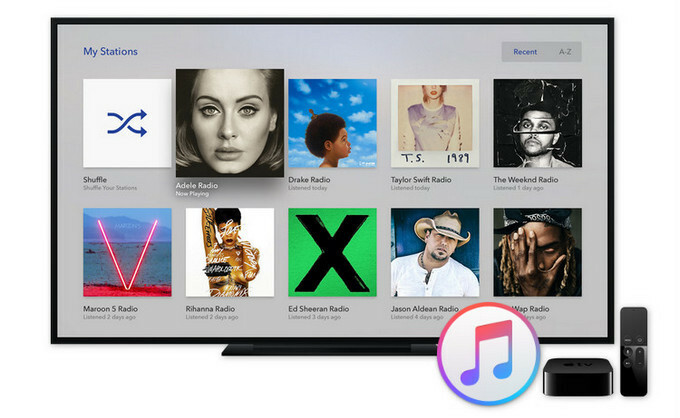 Method 2: How to Get Apple Music on Apple TV without iCloud Music Library? It's very easy to play Apple Music on Apple TV 4 through iCloud Music Library, but what if you want to play Apple Music on Apple TV 1/2/3 that don't support Apple Music, or you simply don't want to use the iCloud Music Library to access your music? 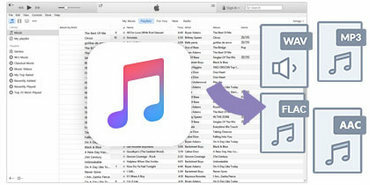 You can use the third-party software to convert the Apple Music music into plain MP3 audio format and sync to Apple TV. 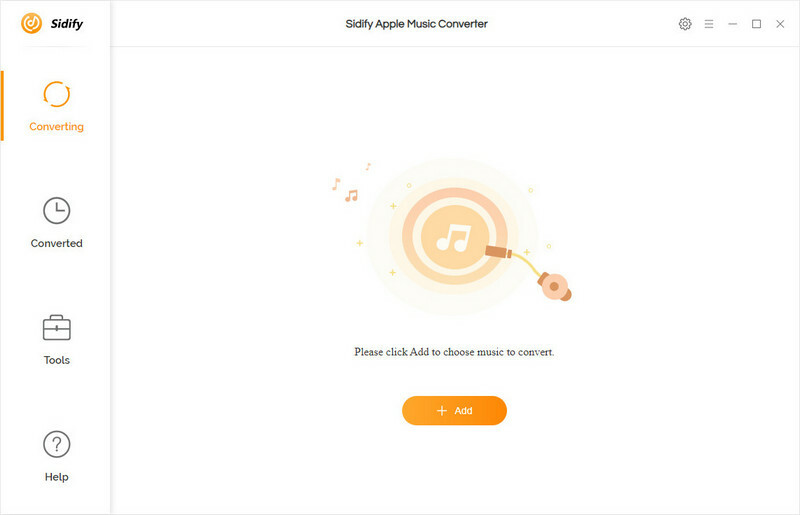 If you want to convert without fiddling with any settings, using as few clicks as possible, we recommend you try Sidify Apple Music Converter, which is especially suited to quickly setting up a conversion for Apple Music and iTunes purchased music. Highly compatible with the latest iTunes and Mac/ Windows OS. The UI of the Sidify Apple Music Converter is simple and easy to use. To strip DRM from Apple Music tracks, follow the below steps. 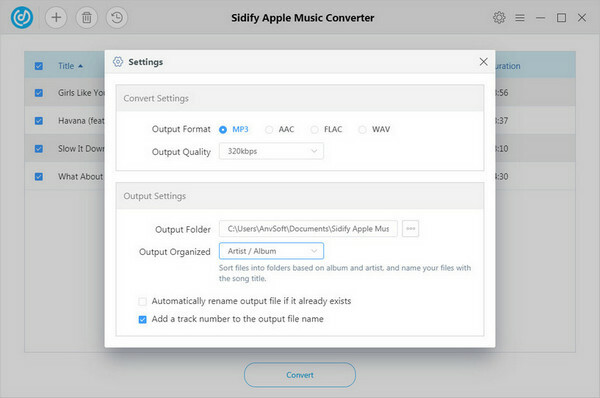 Launch Sidify Apple Music Converter and click "+" on the interface of program, all your tracks downloaded from Apple Music will show out as below. Apple Music tracks that you want to convert. Do so and it’ll give you your familiar iTunes organization in its own window. 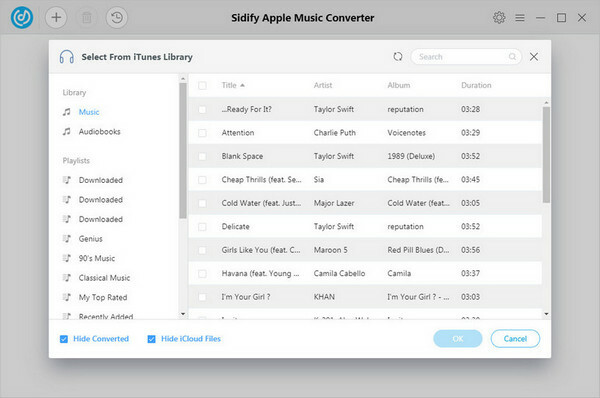 Tip 1: One more thing to notice is that Sidify Apple Music Converter also supports converting all your playable music downloaded from iTunes, including iTunes M4P music, iTunes M4A, M4B and Audible AA, AAX audiobooks to plain MP3, AAC, FLAC or WAV format. Clicking the setting button or the tiny gear icon on the top right of Sidify interface, a window would pop up. Here you can choose output format as MP3, M4A, WAV, FLAC, and adjust the output quality up to 320 Kbps. Besides, the output path is also changeable if required. 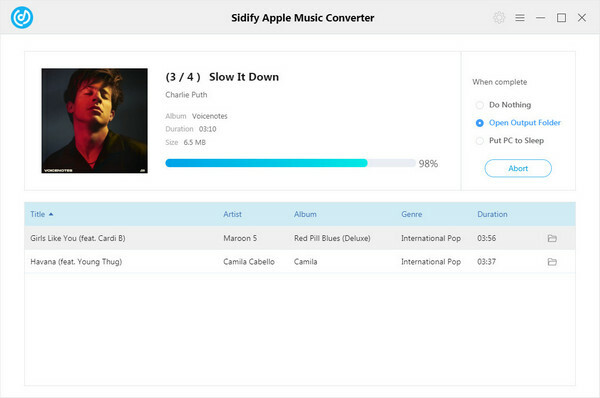 Tip 2: Mac version of Sidify Apple Music Converter can reach up to 20X speed. Once all the files are added to the queue and all the settings are made, go ahead and click on the “Convert” button. Now, click to find the converted Apple Music files under target folder. Tip 3: You can play the converted Apple Music and iTunes music on other devices that support the converted audio format. Sidify maintains the quality of the audio like the original audio quality. The converted songs are as good as the original Apple Music. It even keeps all ID3 tags if they are present in the original iTunes music. Now, you may have a sizable amount of content stored locally on your computer, you can directly enable home sharing and play all of them on your Apple TV. Before you start, make sure that you are running the latest version of iTunes on your Mac or PC. To set up Home Sharing on your Apple TV 4, open Settings >Accounts >Home Sharing. To set up Home Sharing on your Mac or PC, open iTunes and sign in with your Apple ID. Next, go to File > Home Sharing and click Turn on Home Sharing. After that, you can stream Apple Music on Apple TV without limitation. Note: The trial version of Sidify Apple Music converter has 3-minute conversion limit. If you want to unlock the time restriction, you'll need to spend just $39.95.